I'll be upfront: I'm not wild about Moria. It's a thorough enough treatment of Durin's folk from their blasphemous creation under Aule down to the Fourth Age, and many things you'd think to ask about their customs, religion, military structure, and women. But it somehow never feels like ICE's heart is in the project. On the other hand, it was a module I remember having very high expectations for, and maybe I just haven't gotten over the letdown. In retrospect it's certainly not bad; it just could have been a lot more. That the dwarven rings of power aren't detailed is an astounding criminal omission -- Durin's, at the very least, demands the same meticulous attention given to the elven and Nazgul rings in other modules. Moria does score points for its versatile setting: it can be used in any age with few adjustments. Khazad-dum was founded in the misty days of the first, absorbed the tribes of Belegost and Nogrod in the second (the Golden Age of trade with the elves of Eregion), and hit by demonic calamity in the late third. The Balrog period naturally offers the most in terms of dramatic conflict, and the module commendably extends beyond the usual 1640 focus to describe orc tribes (the "fire-ruler" and "slaver" groups), trolls, cave worms, and water-drakes that fill Moria's halls in its time of darkness. It also does well in depicting dwarven technology, such as the elevators, fire wagons, and water wheels that make the mountain kingdom go round. The expected enchantments are also detailed: light stones, watchers (the infamous stone sentinels with piercing gazes), and rune keys like the one on the West-Gate ("speak, friend, and enter"). Those who can overcome these will find a variety of traps around every corner -- chute, dart, plate, spike, steam, pit, wheel -- and the wheel traps are particularly nasty. Where the module lets down is with its mapwork. On the one hand, the treatment is comprehensive, showing all seven levels and seven deeps, and detailing important areas in the key. The problem is that this is done almost exclusively on route maps, with very few rooms zoomed in with standard dungeon layouts. 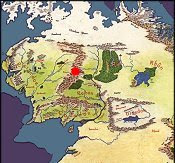 In fact, those rooms can be counted on two hands: The Second Hall and Durin's Bridge, the West-Gate and Western Entry Hall, the East Entry Hall, the Chamber of Records on the seventh level, the Balrog's Lair in the sixth deep, the Chamber of Teeth in the seventh deep, and the King's Chambers & Armory in the seventh deep. Rooms and areas covered on the route maps are described adequately enough but can barely be envisualized. This contrasts sharply with Mount Gundabad, The Grey Mountains, and Goblin-Gate, which present their mountain cities in the close-up way gamers expect. The Balrog's Lair (formerly the dwarven king's smithy) is a highlight, boasting a hall of enchanted mirrors, the grim hall of questions, and animated dragon columns. And this Balrog can fly, unlike Tolkien's, a departure from the canon I always approved for gaming purposes. 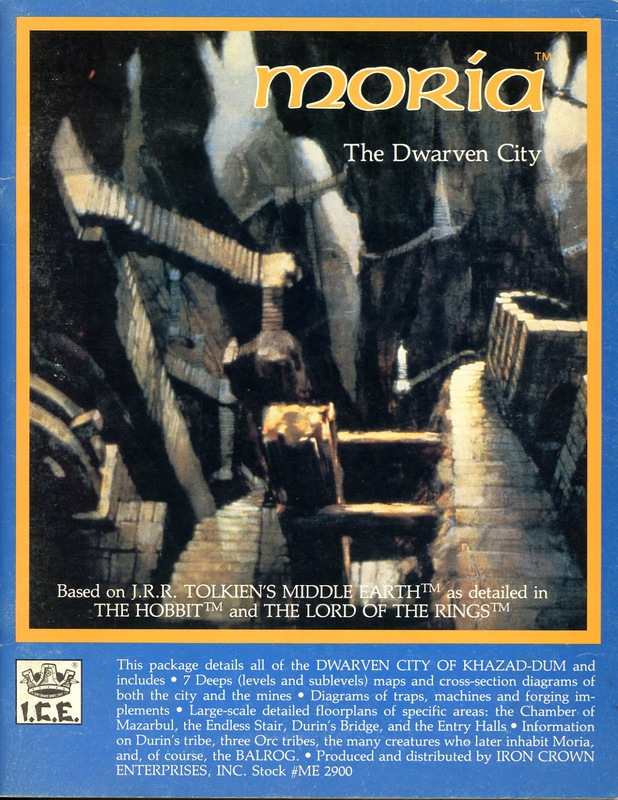 There's certainly enough in Moria to please fans of huge subterranean kingdoms, and the post-1980 material provides rounds of ammunition for DMs to murder PCs under cover of fire and darkness. By rights this should be a module to brandish with enthusiasm. For all its diligence, regretfully, it comes up a bit short. Then there's the cover from the dreadful '70s film, of which it's best I not speak at all. Next up: Lorien and the Halls of the Elven Smiths.